Exciting new fiction from James McBride, the first since his National Book Award–winning novel The Good Lord Bird. The stories in Five-Carat Soul—none of them ever published before—spring from the place where identity, humanity, and history converge. They’re funny and poignant, insightful and unpredictable, imaginative and authentic—all told with McBride’s unrivaled storytelling skill and meticulous eye for character and detail. McBride explores the ways we learn from the world and the people around us. An antiques dealer discovers that a legendary toy commissioned by Civil War General Robert E. Lee now sits in the home of a black minister in Queens. Five strangers find themselves thrown together and face unexpected judgment. An American president draws inspiration from a conversation he overhears in a stable. And members of The Five-Carat Soul Bottom Bone Band recount stories from their own messy and hilarious lives. 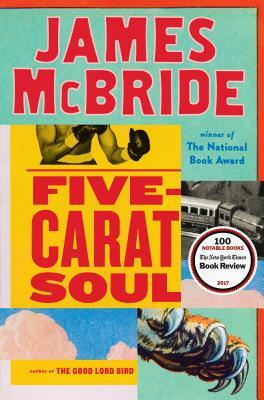 As McBride did in his National Book award-winning The Good Lord Bird and his bestselling The Color of Water, he writes with humor and insight about how we struggle to understand who we are in a world we don’t fully comprehend. The result is a surprising, perceptive, and evocative collection of stories that is also a moving exploration of our human condition. James McBride is an accomplished musician and author of the National Book Award–winning The Good Lord Bird, the #1 bestselling American classic The Color of Water, and the bestsellers Song Yet Sung and Miracle at St. Anna. He is also the author of Kill ’Em and Leave, a James Brown biography. A recipient of the National Humanities Medal in 2016, McBride is a Distinguished Writer in Residence at New York University.